Yeah...that is gret news! Looking forward to getting a t shirt or hoodie! They now have the tour-programme on sale for 15 EUR! It is really worth the price, I would say. 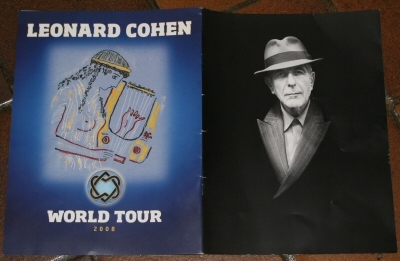 It consists of 24 pages, is beautifully designed with lots of concert pictures taken by Lorca Cohen, an introduction by Pico Iyer, photos from the rehearsals, Lyrics from various songs, drawings and poems of Leonard, a presentation of every single musician, photos of the whole crew, the itinerary of the first leg of the tour. Unfortunately, I don't have a scanner so I can't provide pictures of it. By the way, I wanted to buy Sharon's CD but they wanted to charge me 25 EUR for it which I think is far too much. How much did the CD cost at the other concerts? If anyone is going to a concert soon, i would be most grateful if they could get me a programme. I will paypal you the money and the postage. I bought Sharon's CD for 20 Dollars (Canadian) in Montreal. when i was at the manchester concert there were no programs how do i get one now? Would anyone be so kind to pick me up a tour program? I'd be happy to pay all costs and even give something extra for their time and effort. 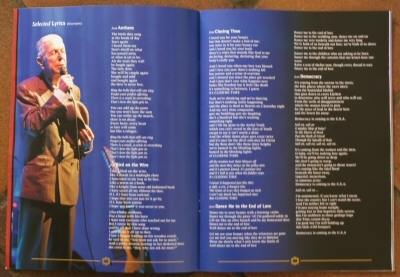 Can we buy the tour programme in the online store when it is online? I was at the concert in Amsterdam, but I forgot all about the merchandise. I was in heaven all the time and didn't think about worldly stuff as buying t-shirts or programme books. Now I'm returning back to earth (very slowly and reluctantly) and I regret that I don't have something tangible to proof that I was there. Help if you can! And thank-you in advance! 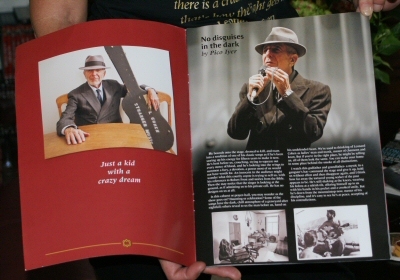 I will do ANYTHING for a program.....will bear a child for one that is signed!.....If anyone can obtain an extra, I would be more than happy to express pay, including postage, etc...please! In Copenhagen for the concert the other weekend, I saw a guy wearing a splendid t-shirt bearing the simple legend "THEN WE TAKE BERLIN". It is apparently sold by a company in Denmark called Wood Wood. I have done some digging but can not find it on sale anywhere. Anyone have any ideas?